Is The Home Depot, Inc. (HD) A Good Stock To Buy? Insider Monkey finished processing more than 700 13F filings made by hedge funds and prominent investors. These filings show these funds’ portfolio positions as of September 30th. What do these smart investors think about The Home Depot, Inc. (NYSE:HD)? Is The Home Depot, Inc. (NYSE:HD) undervalued? Money managers are betting on the stock. The number of long hedge fund bets improved by 5 recently. Our calculations also showed that HD isn’t among the 30 most popular stocks among hedge funds. 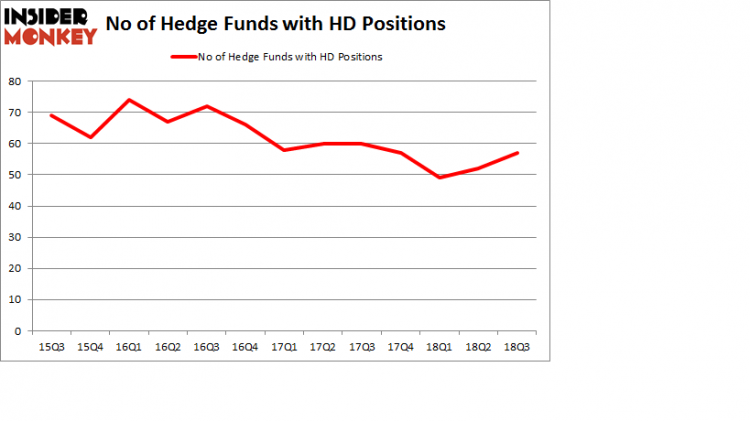 HD was in 57 hedge funds’ portfolios at the end of September. There were 52 hedge funds in our database with HD holdings at the end of the previous quarter. According to most market participants, hedge funds are seen as underperforming, outdated financial vehicles of years past. While there are greater than 8,000 funds trading at present, We look at the elite of this club, about 700 funds. These investment experts administer the majority of all hedge funds’ total asset base, and by watching their unrivaled equity investments, Insider Monkey has determined a few investment strategies that have historically beaten Mr. Market. Insider Monkey’s flagship hedge fund strategy exceeded the S&P 500 index by 6 percentage points per year since its inception in May 2014 through early November 2018. We were able to generate large returns even by identifying short candidates. Our portfolio of short stocks lost 24% since February 2017 (through December 3rd) even though the market was up nearly 23% during the same period. We just shared a list of 11 short targets in our latest quarterly update. Let’s take a look at the recent hedge fund action surrounding The Home Depot, Inc. (NYSE:HD). Heading into the fourth quarter of 2018, a total of 57 of the hedge funds tracked by Insider Monkey held long positions in this stock, a change of 10% from one quarter earlier. On the other hand, there were a total of 57 hedge funds with a bullish position in HD at the beginning of this year. So, let’s check out which hedge funds were among the top holders of the stock and which hedge funds were making big moves. The largest stake in The Home Depot, Inc. (NYSE:HD) was held by Fisher Asset Management, which reported holding $921 million worth of stock at the end of September. It was followed by Arrowstreet Capital with a $895.4 million position. Other investors bullish on the company included Two Sigma Advisors, AQR Capital Management, and Adage Capital Management. Now, some big names have jumped into The Home Depot, Inc. (NYSE:HD) headfirst. Highbridge Capital Management, managed by Glenn Russell Dubin, initiated the largest position in The Home Depot, Inc. (NYSE:HD). Highbridge Capital Management had $5.8 million invested in the company at the end of the quarter. Ian Simm’s Impax Asset Management also made a $3.2 million investment in the stock during the quarter. The following funds were also among the new HD investors: Dmitry Balyasny’s Balyasny Asset Management, John Orrico’s Water Island Capital, and Bart Baum’s Ionic Capital Management. Let’s also examine hedge fund activity in other stocks similar to The Home Depot, Inc. (NYSE:HD). We will take a look at Chevron Corporation (NYSE:CVX), Taiwan Semiconductor Manufacturing Company Limited (NYSE:TSM), Cisco Systems, Inc. (NASDAQ:CSCO), and Verizon Communications Inc. (NYSE:VZ). This group of stocks’ market valuations resemble HD’s market valuation. As you can see these stocks had an average of 51.75 hedge funds with bullish positions and the average amount invested in these stocks was $3.27 billion. That figure was $4.53 billion in HD’s case. Cisco Systems, Inc. (NASDAQ:CSCO) is the most popular stock in this table. On the other hand Taiwan Semiconductor Mfg. Co. Ltd. (NYSE:TSM) is the least popular one with only 42 bullish hedge fund positions. The Home Depot, Inc. (NYSE:HD) is not the most popular stock in this group but hedge fund interest is still above average. This is a slightly positive signal but we’d rather spend our time researching stocks that hedge funds are piling on. In this regard CSCO might be a better candidate to consider a long position.